Rivers State Governor, Barrister Ezebunwo Nyesom Wike while hosting Rivers Angels to a state dinner following their feat at the Federation Cup tasked the team to retain the NWPL title as another reward awaits them. According to the Team manager, Matilda Michael Oyiloha the team is ready to take on Nasarawa Amazons whenever a date is decided. “Even up to yesterday the girls were prepared to go for that tournament because when we were hosted, the governor made it known to us that he is waiting for that trophy,” Oyiloha said in a release made available to allnigeriasoccer.com. “So whenever the women’s league calls upon us, we’ll be ready to defend our title.” . The reigning Women’s Federation Cup Champions took to the Church on Sunday to appreciate God for a successful 2016 football campaign. 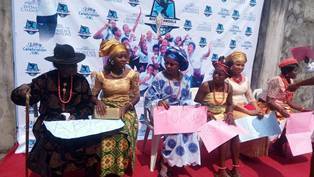 There were lots of side attractions after the thanksgiving service at the reception held inside the camp of Rivers Angels as families and friends of the players were thrilled with dressing, cooking, eating and dancing competitions amongst the players.